Indian festivals show a unique way of celebrating culture and tradition. Among many other popular beliefs, food is one expression that brings people together and binds them with a community feeling. The number of festivals and the number of days in a year appear to be equal in this land. And when it comes to my family, it is not an exaggeration when I say that there is a high possibility that if we start counting the festivals, the number might as well be more than the number of days! I grew up in a family that follows many rituals and takes time and effort in performing pooja and observing the days in their authentic significance. Today, as a mom, while I might not observe all the days with such endurance, I choose to enjoy and take part in at least the ones that are close to my heart. One important aspect that cannot be overlooked irrespective of festivals with varying intensities is – of course, food! I might miss religious rituals, but never a chance to taste the local delicacies that achieved prominence over time and come as a combo, that is unique to each festival. For example, one cannot imagine Ganesh Chaturthi without modaks, christmas without plum cake and eid without seviyan! While some perform rituals for religious purposes, there are others who do it for spiritual reasons or to keep the tradition alive or for pure pleasure. If not for religious reasons, mostly I find myself performing rituals as a form of self-expression. 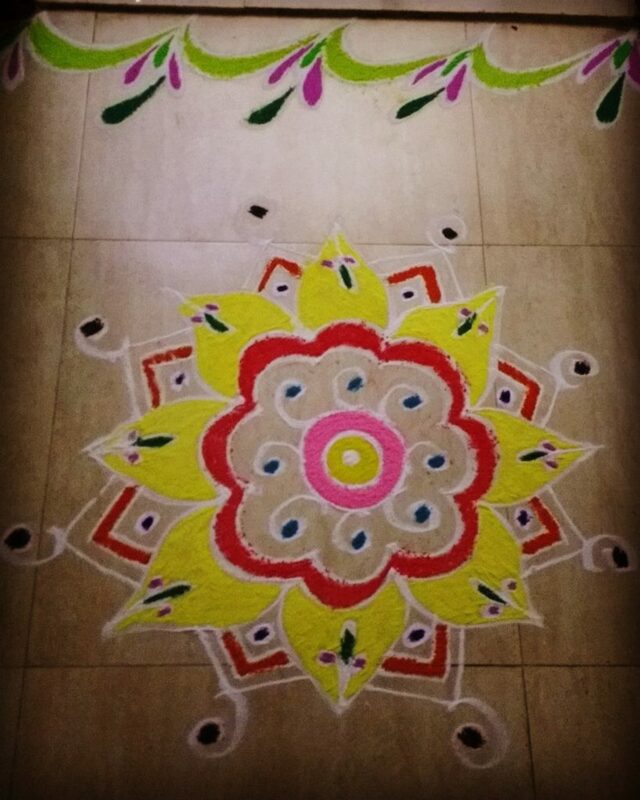 Like when I put this rangoli, the main intention is to make use of this opportunity (on a festival day) to express my creative self, which I would otherwise postpone doing it on a a regular day. It also a meditative process when I light the diya and use dhoop for fragrance. Also, rituals like breaking handi/utti for janmashtami are popular and enjoyed by the majority. If it is a major festival, people working out of their native place take this opportunity to visit family and friends back home. Flying kites, bullock cart rides, making rangoli, keeping bommala koluvu/golu etc are some of the practices that favor spending time with family. A traditional celebration sometimes calls for having family lunch in banana leaves filled with mouthwatering festival recipes. 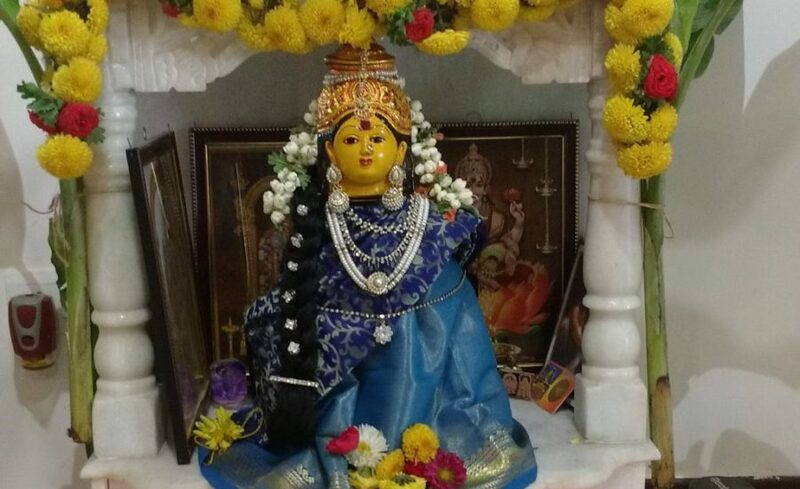 Come varalakshmi vratham, and I would be engrossed in idol making! Other festivals, I would be engrossed in making rangolis or getting other forms of decor ready. Needless to say, I enjoy the way Indian festivals bring out the creative best in each of us. Finally, we reached the most relevant feature, the food. While daily cooking in India itself offers diversity, festival recipes are like the icing on the cake. My sister and I always look forward to my mom’s handmade puliogare/pulihora on all festivals! Having a sweet tooth made me love festivals even more. Sometimes I wonder, if offering to God is just an excuse to please our own taste buds? Like, few days back I tasted a dhaniya based sweet powder, called dhaniya panjiri, that is made especially for Janmashtami and it was just yum. I never heard of this variation before and all thanks to our friends from diverse backgrounds. Even the most common modak would taste differently across different states of India. And no matter what, you do not get to taste these authentic delicacies in restaurants. Indian home kitchens have a monopoly over festival recipes, isn’t it? That is the reason why we never miss an event to bring to you the festival recipes, contributed by housewives and moms of India. With this platform, you can try a new modak variation, new barfi variation, new gujiya variation etc in your own kitchen. For example, even if you are cooking at your home in Karnataka, with these recipes you get to taste the flavors of Mathura! Keep watching this space for our upcoming Indian festival recipes, curated just for you, that are sure to entice you!